for $4,499,000 with 7 bedrooms and 6 full baths, 1 half bath. This townhouse was built in 1870 on a lot size of 17'x73'. This spectacular Brooklyn mansion truly offers the best of both worlds. 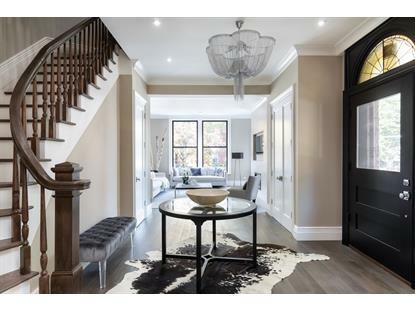 Designed by noted architects R. H. Robertson and A. J. Manning '“ and built in 1901, this one-of-a-kind townhouse is an architectural masterpiece. Its land-marked Romanesque-Revival facade is characterized by detailed masonry work, and beautiful stained glass and semi-circular arched windows. 215 Clinton Ave is located on a corner '“ and as a result, its three exposures provide ample sunshine throughout the day. 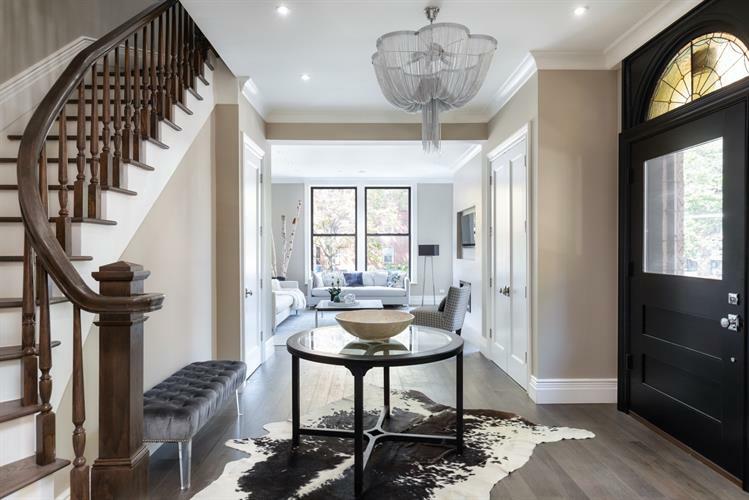 Stately and timeless, the home includes both a 4-story, 5-bedroom, 4.5-bath owner's residence with a grand entrance on Willoughby Avenue, as well as a 2-bedroom, 2-bath garden level apartment. A private attached garage is also included with the property. On the first floor, the main house boasts 11' ceilings, new oak hardwood floors and custom molding throughout. The gracious foyer is crowned by a dramatic beaded chandelier and features a powder room for guests. The entry leads to the large living room with oversized 3' by 7' windows and a remote-controlled gas fireplace with sleek ceramic surround and pre-wired television nook. The formal dining room is also complete with a fireplace and modern chandelier '“ and is adjacent to the state-of-the-art kitchen. With a design sure to please the most discriminating chef, this luxurious yet functional space has a full suite of Miele appliances, including a built-in double oven, microwave and 5-burner cooktop with retractable vertical downdraft vent system. Imported from Italy, the white Pedini cabinetry features soft close doors, under-cabinet L.E.D. lighting and striking chrome hardware. In addition, the 48" French door refrigerator is paneled to match. The countertops and large island are clad in Silestone quartz, and a Wolf wine cooler is also provided '“ perfect for storing a collection of white and sparkling wines. Off the kitchen is a private Timbertek deck under a canopy of shade trees, ideal for entertaining or al fresco dining. A winding staircase with custom seamless handrail leads to the home's upper levels. The full-floor master suite is a lavish retreat and consists of a library with gas fireplace that leads to the owner's private deck. The sleeping area is connected to the windowed master closet, which is lined with custom cabinetry for clothing storage. The elegant master bath is outfitted with a wet room behind half-inch thick glass, which includes dual showerheads and a sculptural deep soaking tub. Other thoughtful features of this spa-like oasis include radiant-heated porcelain tile floors, a heated towel rack and double vanity with fog-free mirror. Both the master and secondary baths at 215 Clinton Avenue are fitted with graceful Porcelanosa fixtures. The residence's upper levels are home to 4 additional bedrooms, and 3 baths '“ all completely renovated to the highest standard. A laundry room can also be found on the 3rd floor. The duplex apartment below is finished with the same high-end materials as the main home. These spacious living quarters include an open L-shaped kitchen with Pedini cabinetry and Bosch appliances, two gleaming baths and a lower-level recreation/media room. A stacked Electrolux washer and dryer provide the ultimate convenience. The unit can be accessed via a private entrance on Clinton Avenue.